The new training schedule for 2019 is out. Region 1 (our region) training will be in May, at Panama City. 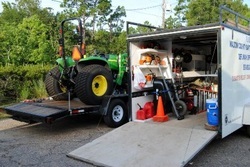 Cleanup and Recovery Equipment Trailer and Debris Tractor. By ministering to physical needs through moving downed trees from homes, securing tarps over roofs, and doing what it takes to make a dwelling safe and secure. By ministering to emotional needs through spending time with, listening to and caring for disaster survivors. By ministering to spiritual needs through sharing the gospel by our example, words and literature, and connecting people to local churches. Any Questions, or if you have an interest in participating, please contact us or the Walton County Baptist Association. For other events see the state schedule. Some photos of our equipment.